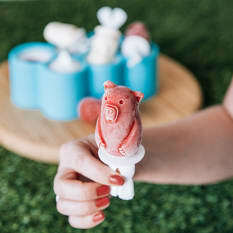 The Zoku Mini Slow Pop Mould makes nine mini pops, quickly and easily. Just fill with the contents of your choice, and pop in the freezer to set. These little guys are about the size of an apricot, making them perfect for small hands. They make excellent boozy, grown up pops, too. View more from For the Minichefs, Ice Lolly Makers & Accessories, Zoku Slow Pop Makers. 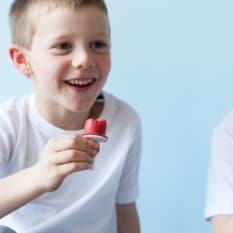 These mini pops are amazing, they fit nicely into the freezer, they pop out easily and they are exactly the right size for my son to eat, although he does have about 3 at a time ;) We have a juicer, so we juice fruit and then put them in these little moulds and so I am very happy when my son wants them! Fun and healthy! I absolutely love this product. I made berry frozen yoghurt pops in half the moulds and poured boxed litchi juice in the other half. Both came out easily and my friends 2 year old loved them! 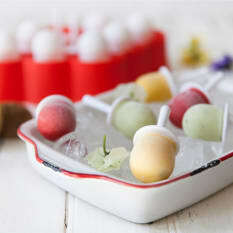 I'm thrilled with the Zoku Mini Slow Pop Freezer Mould that I bought recently. The size of the moulds is perfect for my young grandchildren. Its easy to clean and refill and convenient to include a different range of flavours in its user friendly mould. It really is so easy to get the pops out, a 7-year old can manage it (I don't have a 5-year old around, but I'm sure they'll manage too! ), which Mommy really appreciates, following years of running under hot water. My only gripe at this point is that the diamond lay-out takes up more space in my freezer than I would like, but it's not a deal-breaker.